I think there is a lot of misconceptions about what is alcohol affect on human body, weight, and obesity. Is it true or is a misconception that alcohol is fattening, we will try to clarify in the following text. The general formula for the alcohol is R-OH. 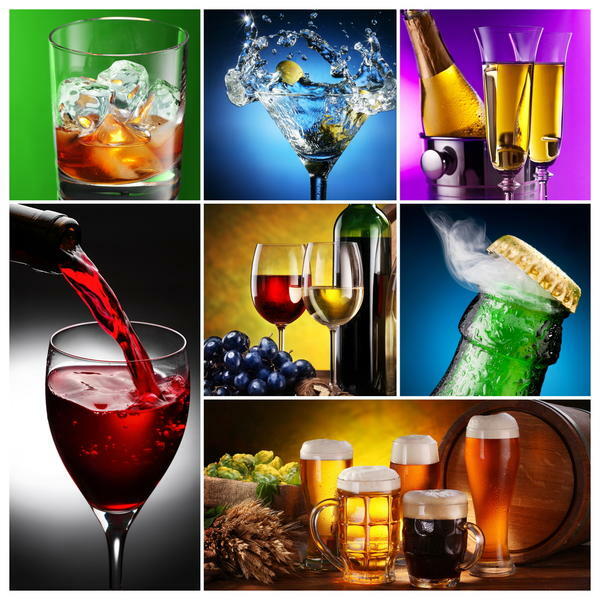 Out of all the alcohol in the alcoholic beverages is ethyl alcohol or ethanol. Prepared fermentation of fruits and cereals that contain sugar. Alcohol as alcohol it self can not be stored in fat, that mean calories from alcohol can not be converted into fat. 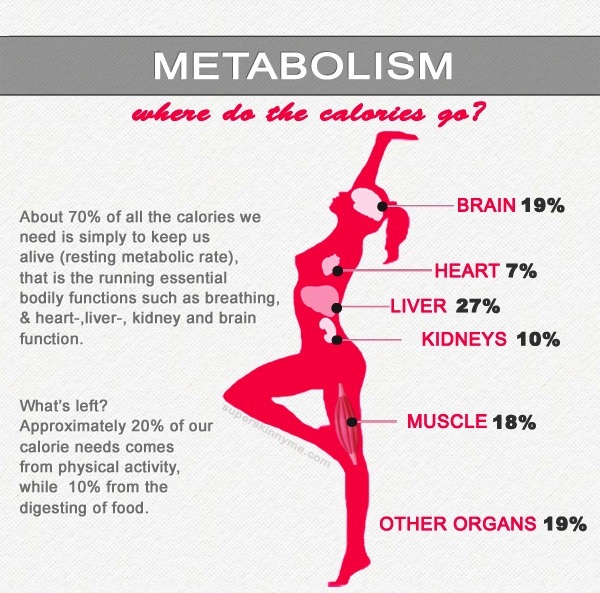 But alcohol has a significant impact on our metabolism and thus indirectly on spending our calories and speed of metabolism. It decreases the secretion of the hormone testosterone and growth hormone significantly affect the rate of metabolism and the growth of muscle tissue. For example, a study conducted by the TNO Institute for Food and Nutrition, had 10 subjects who drank 30-40 grams of alcohol a day (2-3 beers or wine 10-15 grams). After 3 weeks, their testosterone levels decreased by approximately 7%. 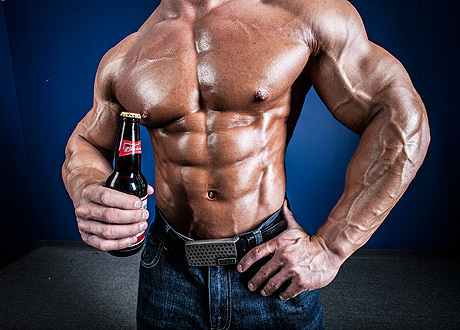 University of Helsinki conducted a similar study, they were given to respondents 1.5 g ethanol per kg of body weight in 10 healthy men aged 20-26 years, and found that their testosterone levels decreased by 23% on average between 10th and 16th hours after they started drinking. In addition, the level of cortisol (stress hormone) was increased by 36% on average, so the growth hormone significantly reduced started to light. There are good effects of moderate alcohol consumption. Moderate consumption of beer (3 to 6 dl / day) stimulates the immune system and reduces the fat in the blood. Three to four cups of beer decreased levels of C-reactive protein (linked to inflammation and with various diseases of the heart), which tells us about anti inflammation action and partly explains the association between moderate alcohol consumption and reduced heart problems. Since ancient times, stories about the benefits of 1 to 2 glasses of red wine. Nutrients in wine are also beneficial for the heart because it reduces stress, whereas alcohol dilates blood vessels. The bad effects of excessive alcohol consumption are: Encourages dehydration. Alcoholic drinks are diuretics that encourage us to urinate. Going out and drinking until the late hours making lower levels of important hormones in the blood. These hormones are secreted in a deep sleep, mostly during the night. After one drunk is necessary 24h to testosterone levels return to normal. Alcoholic drinks are oversaturated in sugars. This can result in a disorder of blood sugar levels. After alcohol consumption leads to faster muscle fatigue. After drunkenness in our muscles remains a greater amount of lactic acid than usual and therefore our body needs less time to be tired. Possible are the same, muscle aches and cramps. Hinders absorption of vitamins and minerals. Through urination usually out just useful vitamins and minerals we need to function normally. Increases the risk of injury. In the same way, extended recovery time. Reduces stamina. Organism for the production of energy required sugar in the bloodstream. The sugar is produced by the liver, into the blood stream releasing glucose. Alcohol lowers the body’s ability to produce this sugar (glucose), which is why people have less energy and are less durable. Hinders the production of glycogen. Glycogen is produced in the liver, which also breaks down alcohol, so it is very easy to conclude that alcohol consumption burden on the liver and thus reduces and slows the production of glycogen necessary for intensive muscle work. Neck pain is a common occurrence these days. Long sitting on the computer, a desk, behind the wheel is the common causes of this problem. In this article we will explain this phenomen and try to help in the elimination of the same. Pain in the cervical spine may spread to one or both shoulders, shoulder blades or the front of the chest, and neck stiffness were monitored and limited motion of the cervical spine. If the pain from the door wider to one side of the head, there may be visual disturbances, noise or tinnitus, balance disorders, dizziness, nausea and vomiting. Pain can be spread in one or both arms, and fingers can occur numbness in the fingers and arms along, decreased or increased sensitivity of the skin and loss of strength in his hand. Straining muscles. Overuse of the neck muscles, such as driving too many hours hunched over the wheel, sitting in an irregular situation often causes pain in the neck area. 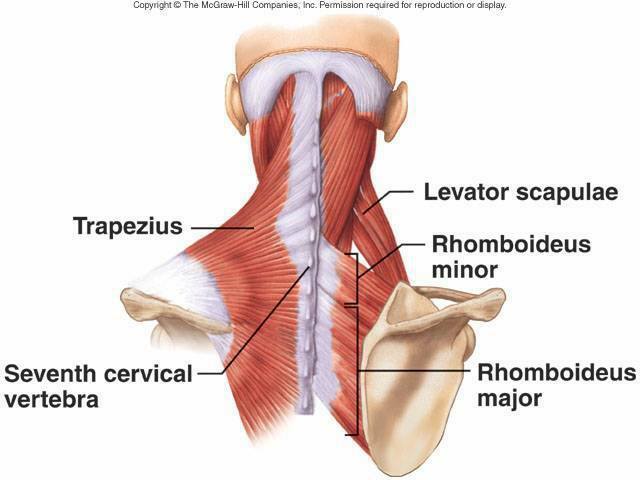 Even minor things like reading in bed or sleeping in the sitting position can overburden your neck muscles. Damaged joints. Just like all the other joints in your body, and neck joints tend to be subjected to abrasion in accordance with age, which can lead to osteoarthritis in the neck. Nerve compression. 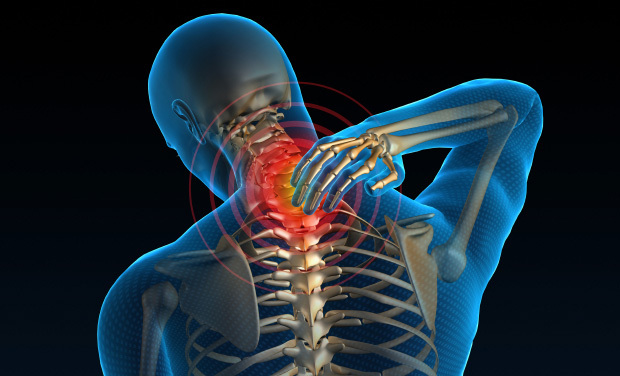 A herniated disc or bone marrow in the cervical vertebrae can cause pressure on the nerves of the spinal cord injury. Injuries. Auto collisions and accidents often result whiplash and neck injuries, which occur when the head is going backwards flick moves rapidly forward, it is stretching the soft tissues of the neck beyond their borders. Diseases. Neck pain can sometimes be caused by a disease, such as rheumatoid arthritis, meningitis or cancer. In the chronic phase, when reducing the intensity of pain and the spine becomes more mobile, applied for easing pain and spasms physical therapy, massage, electrotherapy and stretching. Physical therapy includes warm compresses, therapeutic ultrasound that serve as an introduction to kinesitherapy (movement therapy, medical gymnastics). Stretching, isometric exercises to strengthen the muscles, relieving exercises and posture exercises. It is important to emphasize the importance of medical gymnastics in the restoration and / or maintenance of the function of the cervical spine. 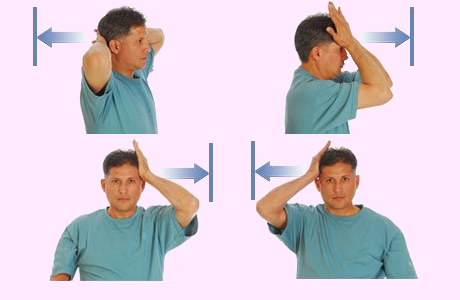 The exercises used in strengthening the neck muscles are generally static or mild and slow dynamic exercise. They should be run 3 times a week for 20 minutes. Lightweight door rotation in all directions with a slight stretch. Around 12 rotation each side or 12 move up and down, left or right, slowly. Pressure with hand in the opposite side of the carriage and the strengthening of the neck muscles with static contractions. Try to hold in position for couple of second and then change the side. 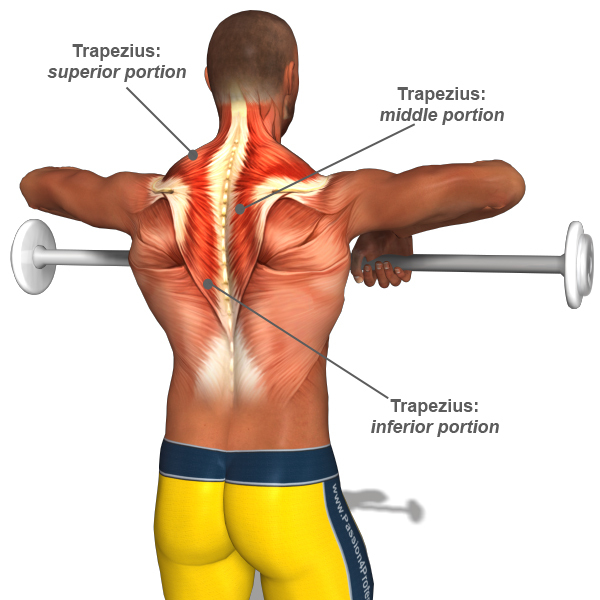 Strengthening Trapezius dorsal and cervical muscles, which is very important for proper posture and maintain the head in the proper position in the effort. The exercise is performed from a starting position with hands outstretched and pulling this towards the chin with a mandatory deflections elbows above shoulder level. Make sure that rod with a weight not too heavy. From 10 to 15 repetitions 3 to 4 sets. Bol u vratu je česta pojava u današnje vreme. Dugo sedenje za kompjuterom, radnim stolom, za volanom su česti uzroci ovog problema. U ovom tekstu ćemo objasniti ovu pojavu i pokušati da vam pomognemo u otklanjanju iste. Bolovi u predelu vratne kičme mogu se širiti prema jednom ili oba ramena, lopaticama ili prednjoj strani grudnog koša, a praćeni su ukočenošću vrata i ograničenim pokretima vratne kičme. Ako se bolovi iz vrata šire u jednu stranu glave, mogu se javiti poremećaji vida, šum ili zujanje u ušima, smetnje ravnoteže, vrtoglavica, mučnina i povraćanje. Bolovi se mogu širiti i u jednu ili obe ruke, sve do prstiju, može se javiti trnjenje u prstima i duž ruke, smanjena ili povećana osetljivost kože i gubitak snage u ruci. Naprezanje mišića. Prekomerna upotreba vratnih mišića, kao što je previše sati vožnje pogrbljeni nad volanom, sedenje u nepravilnom položaju često izaziva bol u vratnom delu. Čak i manje stvari kao što su čitanje u krevetu ili spavanje u sedećem položaju mogu da preopterete mišiće vrata. Oštećenje zglobova. Baš kao i svi ostali zglobovi u vašem telu, i zglobovi vrata imaju tendenciju da se podvrgnu habanju u skladu sa godinama, što može dovesti do pojave osteoartritisa u predelu vrata. Nerve kompresije. Hernija diskova ili koštane srzi kod vratnih pršljenova može da izazove pritisak na živce iz kičmene moždine. Povrede. Auto sudari i nesreće često rezultiraju i trzajne povrede vrata, koji se javljaju kada se glava koja ide unazad pomera trzajem naglo napred, to je istezanje mekih tkiva vrata izvan njihovih granica. Bolesti. Bol u vratu ponekad može biti uzrokovan bolestima, kao što su reumatoidni artritis, meningitis ili kancer. U hroničnoj fazi, kad se smanji intenzitet bolova, a kičma postane pokretljivija, primjenjuje se za popuštanje bolova i spazma fizikalna terapija, masaža, elektroterapija i istezanje. Fizikalna terapija podrazumeva tople obloge, terapijski ultrazvuk koje služe kao uvod u kineziterapiju (terapija pokretom, medicinska gimnastika). Vežbe istezanja, izometričke vežbe za jačanje mišića, rasteretne vežbe i vežbe držanja. Bitno je istaknuti važnost medicinske gimnastike u ponovnom vraćanju i/ili održavanju funkcije vratne kičme. Vežbe koje se koriste pri jačanju vratnih mišića su uglavnom statičke ili blage i usporene dinamičke vezbe. Dovoljno ih je izvoditi 3 puta nedeljno po 20ak minuta. Lagana rotacija vrata u svim pravcima kao na prvoj slici uz lagano istezanje, i na drugoj slici pritisak rukom u suprotnu stranu od pomeranja glave i jacanje vratnih mišića statičkim kontrakcijama. Jačanje Trapezius leđnog i vratnog mišića koji je jako bitan za pravilno držanje tela i održavanje glave u pravilnom položaju pri naporima. Vežba se izvodi iz početnog položaja sa ispruženim rukama i povlačenjem tega ka bradi uz obavezno odizanje laktova iznad nivoa ramena. Paziti da šipka sa tegom ne bude preteška. Od 10 do 15 ponavljanja u 3 do 4 serije. In addition to the frequent and high-quality training is very important to properly feed, also before and after training. From this depends on whether the training will be better and more effective later. The ratio of the importance of training and nutrition today might be in the ratio 50 : 50, though some believe that is 30 : 70 in favor of nutrition. It tells you how important nutrition is to achieve appropriate results, recovered your body of training and effort and also rest for the next. Today, professionals and top coaches professional athletes devote more attention to recovery than the training. Here are some groceries and nutrients that are essential before and after your workout. Pre Workout Snack. Take the meal 1 to 2 hours before training ( those with a fast metabolism 1 hour before training, those with slower 2 hours before training ). 30 minutes before your workout, take appropriate supplements. These food boxes that are listed mainly contain complex carbohydrates and beneficial fats, that you need a source of energy during training. It is necessary to eat before your workout, 40-50 grams of carbs and 30-40 grams of protein is quite enough. Too much food will also slow down digestion and burden the stomach. It is best if there is no food in your stomach when you start the training. Post Workout Snacks. Should be taken in the next 60 minutes after training. Food boxes that are on the list after training contain complex carbohydrates ( Glycogen, which is the most important as muscle fuel ) that are used for recovery and energy recovery, as well as proteins that are food for muscle fibers, they recover and rebuild muscle tissue during weight training breaks down. Of course, taking sufficient amounts of protein after training can significantly increase muscle mass and muscle tone. Zašto je važno znati šta je bazalni metabolizam, kolika mu je vrednost kod muškaraca i žena, od čega zavisi, kako se izračunava, i još drugih korisnih informacija ćete saznati u narednom tekstu. Bazalni metabolizam izračunava minimalnu količinu energije koja je potrebna za održavanje osnovnih životnih funkcija organizma. To je ono što vaši organi potroše u stanju mirovanja, odnosno energija koja vam je potrebna za održanje života. Jetra je najveći potrošač energije u mirovanju (oko 27%), zatim mozak (19%), mišići (18%), srce (7%), pluća (9%) i bubrezi (10%). Izraženo u kalorijama, prosečna stopa bazalnog metabolizma za odraslog muškarca iznosi oko 1500 do 2000 kcal/dan, a kod žena 1200 do 1600 kcal/dan. Razlog za postojanje razlike leži u manjim unutrašnjim organima žena i manjem sadržaju mišićnog tkiva (manja ukupna ćelijska masa). Dominantni faktori koji utiču na vrednost bazalnog metabolizma su veličina organizma, starost i pol. Osim toga i unos hrane utiče na stopu bazalnog metabolizma – gladovanje smanjuje bazalni metabolizam delujući kao odbrambeni mehanizam kojim se organizam brani i štedi energiju. Fizička aktivnost takođe menja vrednosti bazalnog metabolizma – nakon završetka fizičke aktivnosti uočava se porast nivoa metabolizma. Primećeno je da nakon dužih aktivnosti (80 do 180 minuta) umerenog intenziteta dolazi do dugoročnog povećanja metabolizma u mirovanju koje traje 24 do 48 h nakon treninga. Dobro je poznato da je metabolizam u mirovanju uvećan za oko 200 kcal/dan kod osoba koje su redovno fizički aktivne u odnosu na one koje nisu. Ako znate koliko iznosi vaš bazalni metabolizam i znate da jednim prosečnim treningom u teretani potrošite od 200 do 500 kcal ( u zavisnosti od vremena trajanja treninga i intenziteta ), onda ćete umeti da svoj dnevni kalorijski unos prilagodite svom cilju. Ako vam je namera da smršate, kalorijski unos mora biti manji od vaše ukupne dnevne potrošnje (bazalni metabolizam plus aktivnost). Idealno je da taj deficit bude oko 500 kcal. Suprotno tome, ako želite masu, unosite 500 kcal više od onoga što je vaša dnevna potrošnja.